A call to Marcel Borgmann at Sea Independent confirms that he's now taken over the central listing for sale of the 25.4m explorer motor yacht Zeewoelf. 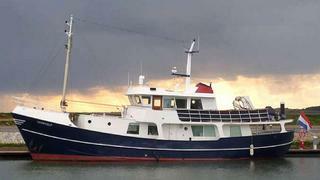 She was launched in 1960, designed by Shipyard de Boot and built by De Vooruitgang. This superyacht underwent a major refit in 2000-2002 during which time she was completely sandblasted and epoxied. With a steel hull and a maximum speed of ten knots from the yacht's single 407hp Caterpillar engine, Zeewoelf has a formidable range of 4,000 miles and is asking €950,000.